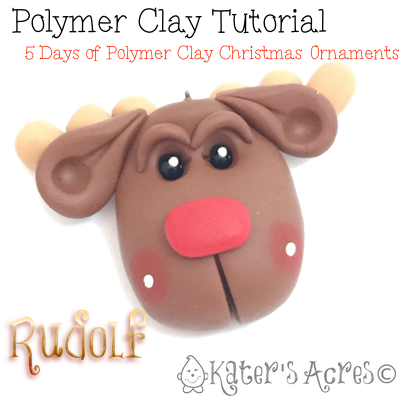 This polymer clay christmas ornament tutorial for this adorable Rudolf the Red Nosed Reindeer can be whipped up in less than 10 minutes. Make one or several. Use them as small gifts, stocking stuffer, or even to tie onto packages for cute doses of whimsical Christmas fun. ENJOY! Roll your raw sienna into a ball. Trim off about 1/4 of the ball for the ears. Roll the remaining ball of clay into a teardrop. Press down about 1/3 from the top slender part of the teardrop to make an indent for his eyes. TIP: This will automatically make his nose appear larger & more bulbous. Take a piece of ecru or beige colored clay and cut into an even 6 pieces. Roll each piece into teardrops and stack as shown. Place the head in the center of the “rack” and press gently with your fingers. Take your extra brown clay you cut aside in the first step and cut it in half. Form two teardrops and smash slightly with your fingers to flatten. Press onto the sides of the head. Add a small piece of red clay in a nice big oval shape for his nose. Place eyes (e-beads) into the shallow part of the head using a needle tool. Use a needle tool to draw a “mouth” from the nose and down the chin.